Celebrity Gossip and Entertainment News: Lorde Betrays Taylor Swift? 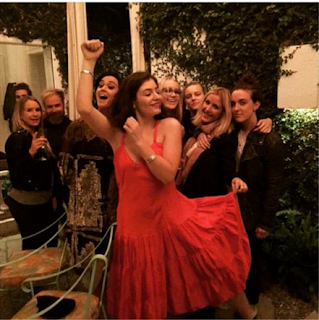 Lorde betrays bff Taylor Swift by hanging with Taylor's sworn enemy Katy Perry. Taylor Swift has an army of BFFLs, and woe to those who might have "good times" with her mortal enemy, Katy Perry. Ellie Goulding was out partying with Lorde and Perry, and put a photo of them having fun on Instagram with the caption, "Don't really remember this but ... good times [dancing flamenco girl]." Then, realizing she made a mortal mistake, she deleted the evidence, but not before it had accumulated almost 60,000 likes and people had taken screenshots of it. Ellie, we knew you were trouble when you walked in. I don't like Katy or Taylor but forced to choose I'd rather hang with Katy cause she doesn't seem as possibly psycho as Taylor does. Taylor seem like the type to act like a scorned lover if you stop being fake besties with her.